The Justice Health and Forensic Mental Health Network was established in 1997 under the NSW Health Services Act. Reporting to the Minister for Health, the Network delivers healthcare to those in contact with the forensic mental health and criminal justice systems, including adults and young people in community, inpatient and custodial settings. The Justice Health and Forensic Mental Health Network performs a vital service by responding to the health needs of over 30,000 patients annually in NSW, a highly vulnerable group who may have only had minimal contact with mainstream community health services. The vision of the Network is to return healthier patients to their communities. To that end, the Justice Health and Forensic Mental Health Network works closely with a variety of organisations including the NSW Ministry of Health, the NSW Police Force, Corrective Services NSW, universities, community groups and advocacy groups. 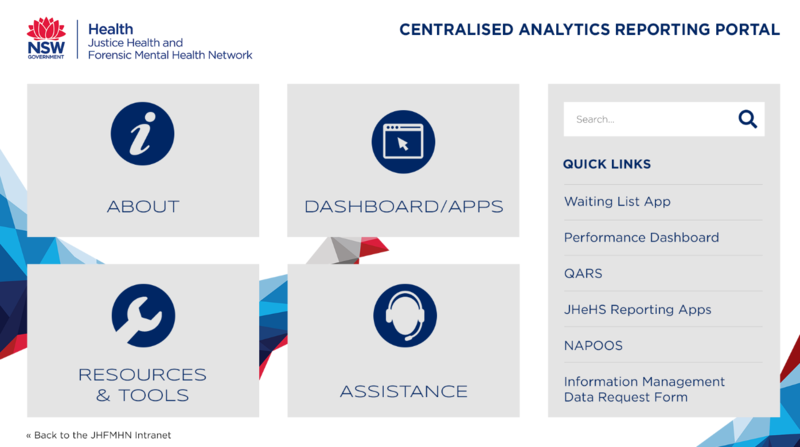 The Justice Health and Forensic Mental Health Network required a design for and integration of their new Centralised Analytics Reporting Portal (CARP), which would function as a central access point for all their reporting and auditing databases, as well as a corporate and clinical analytics platform. The design needed to be easy to use, responsive and accessible from within their existing intranet system. To achieve this, the Network came to the experienced team at TWMG. The Website Marketing Group developed CARP as a sub-site within the existing intranet of the Justice Health and Forensic Mental Health Network using SharePoint 2010. 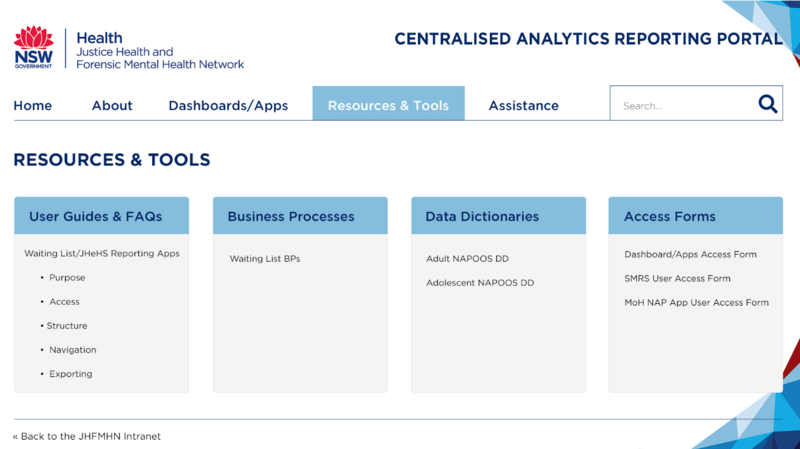 The central focus of the design was to create a user-friendly, reliable and responsive portal where the Network could store the important databases, reporting systems and apps used in their work, including the NAPOOS (Non Admitted Patient Occasions of Service) which is a mandatory NSW Health reporting requirement. CARP contains a range of content types including databases, apps, user guides, business processes, data dictionaries and access forms. CARP also incorporates the business intelligence tool QlikView, which allows the Network staff to easily access and gain insight into their analytics. The amount of information stored in CARP necessitated a clear navigation system to ensure ease of use and functionality. 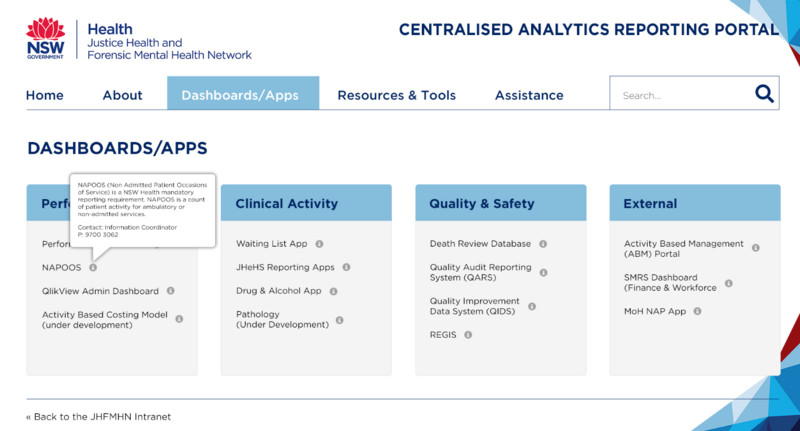 To facilitate this, the CARP homepage contains links to the major pages such as About, Dashboard/Apps and Resources & Tools, but also Quick Links to take users directly to popular apps and dashboards, including the Waiting List App, Performance Dashboard, NAPOOS and the Information Management Data Request Form. If a user needs help, there is also an Assistance section included which contains details on how to use CARP and access its content. 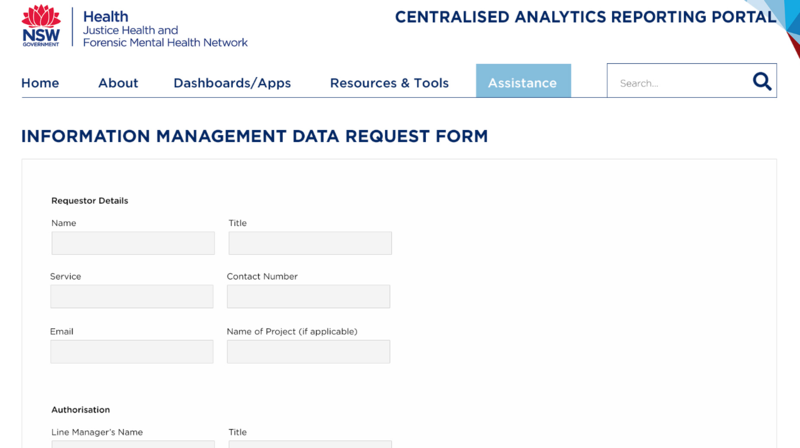 With the design and integration of their new CARP platform complete, the Justice Health and Forensic Mental Health Network are easily able to access the content, data, apps and forms that they require. With CARP, the Network will be able to dedicate increased focus towards quality improvement, cost efficiency and risk management to improve patient care, reduce adverse outcomes and make better decisions using real time data. 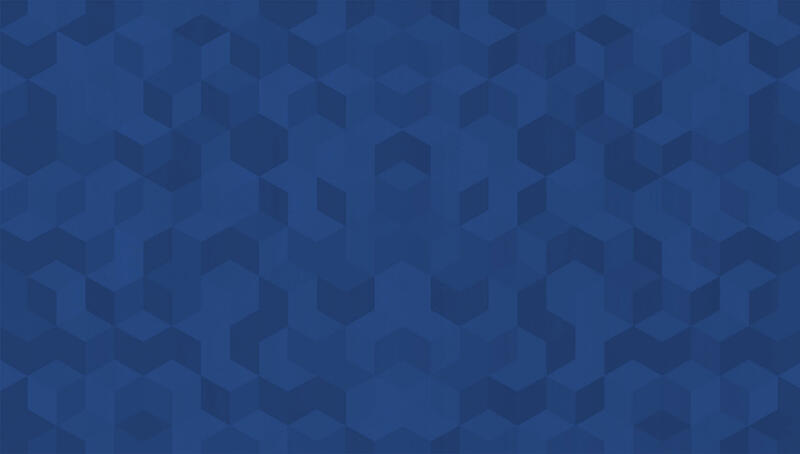 To learn more about the Justice Health and Forensic Mental Health Network, visit their website here. Find out more about our range of intranet solutions here.